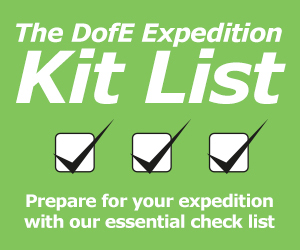 The DofE Expedition Kit Guide is aimed at helping participants and parents to choose and then find the right kit for their expeditions and DofE adventures. Each kit item category includes key information, tips from the experts and money saving ideas. This guide is aimed at those undertaking UK expeditions on foot. This guide is just a summary; the best place to get advice is from your DofE Expedition Supervisor, who will check your kit, and staff at your nearest GO Outdoors, Blacks, Millets, Ultimate Outdoors or Tiso store (Scotland only). Whether you are doing a Bronze, Silver or Gold DofE programme, this guide is just a summary; the best place you can get advice is from your DofE Expedition Supervisor, who will check your kit.